Replacing the current OSHAS 18001, the new standard is intended to offer one single set of requirements designed to help organisations of all types and sizes create and implement systems that proactively prevent work-related injury and ill health. As such, although not coming into full effect until March 2021, businesses are being encouraged to embrace the new standards now in order to ensure they are creating the safest and healthiest environment possible for employees. 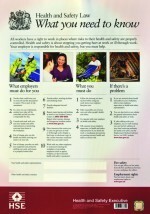 Gregg Elwell, UK technical manager for Bureau Veritas, said: “Unfortunately, the reality is that poor workplace safety remains a huge international issue with the estimated global total of fatal occupational accidents and work-related illness increasing by almost a fifth (19%) in the last three years alone. “At the same time, consumers are also becoming more and more demanding of the companies from which they buy products and services, resulting in tighter deadlines and added pressures – leaving a broader scope for error. To provide greater clarity on the issue, Bureau Veritas has launched a white paper, ‘Understanding the Transition to ISO 45001’, detailing how the new standard can help organisations improve workplace safety. The paper explains the benefits of adopting a health and safety management system, laying out the requirements of the new standard and exploring the advantages of achieving certification. It also provides specific information on key differences compared to existing occupational health and safety management standards. Following the publication of ISO 45001, a three year transition period is now in place after which OHAS 18001 certificates will expire and organisations must achieve certification to ISO 45001. The key European rules regulating the equipment used to protect workers have been left unchanged for more than 20 years. However, a new Personal Protective Equipment (PPE) Regulation (2106/425) will introduce key changes to the way PPE is manufactured, sold and imported within the European Union. Irrespective of Brexit, the legislation offers UK manufacturers of PPE, employers and safety managers a unique opportunity to reassess occupational health and safety. Olivier Touchais, global manager for general safety at Honeywell Industrial Safety, reports.